Best day for burbot last season. We hit the spawn right on and my fishing partner and I both got our limit. We are lucky up in Wyoming we can keep as many as we want and people regularly catch 70-100 in one night. There's always a bigger fish... and I'm going to get it! Here is a picture of a Burbot from Lake Winnipeg caught last weekend walleye fishing. Note the interesting color.... from the limestone bottom, the walleyes also are a light green color.... called Greenbacks. This March was a not bad year for burbot fishing for me. We got on a full moon spawn this year and we really had a blast, All of these came out of one hole in a rockpile ! Surf, how big are the two on the ends? One was 4.5lb and the other was 6lbs. Here's a few from this afternoon. The three lake trout were a bonus. Are they pretty good tasting? Ive heard them called poormans lobster, didnt know if they actually tasted good. Great Picture! Wish i was there!!! In my humble opinion, they are the best eating fresh water fish out there ! 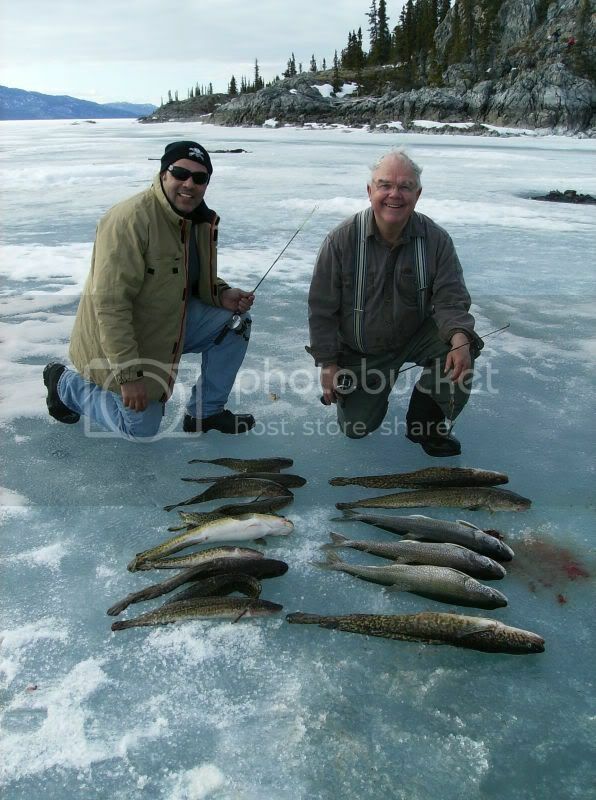 Congrats Ted, thats a Cocker Burbot right there ! The better half and I caught our first Lings up at Lake Nipissing here in Ontario a few days ago. Ended up landing five between us. Freshwater lobster. I'll definitely eat ling (eelpout) again!! Seventy percent water, thirty percent land...it's an ANGLERS WORLD!!! PK Lures -- Catching Fish Redefined! Who says ling are ugly? This is my biggest to date. A little over 33" and it had 10 northern pike minnows in it's gut and still going after my hook. It's around 10lbs. Whoah....nice burbot! What did you catch it on? Caught it on a glow in the dark buzz bomb. Here was a good day in the UP of Michigan last weekend.